New York Attorney General Eric Schiederman today announced a new round of funding to improve communities across New York by restoring or demolishing vacant properties. 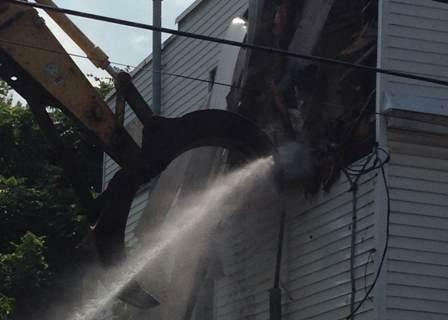 The house at 722 Eastern Avenue in Schenectady came tumbling down Friday, as a crew demolished the property to demonstrate the work being done by the Capital Region Land Bank. In 2011, the state legislature passed a law establishing the land banks, non-profit organizations that are designed to acquire and restore or demolish vacant and abandoned properties. In Schenectady, Schneiderman announced a $20 million round of funding for the state’s land banks, bringing the total amount of funding to $33 million. The latest funding is a result of a 2012 $25 billion settlement with the nation’s largest banks, negotiated by the country’s attorneys general. The building was one of six to be demolished along Eastern Avenue, as part of Schenectady’s Eastern Avenue Improvement Project. Also along Eastern Avenue, upgrades and renovations are planned for another 16 residential properties, and six commercial properties will have their facades redone. “This is an excellent example of what we want communities all over the State of New York to be doing, and the land banks that we are funding through our settlement with banks provide them with the resources to do that," said Schneiderman. Schenectady Mayor Gary McCarthy thanked Schneiderman for his efforts to return money lost as a result of the collapse in the housing market to the communities hit the hardest. “The effects of that collapse and the meltdown in real estate created problems that communities like Schenectady and Amsterdam are dealing with today, and will continue to deal with for years," said McCarthy. Amsterdam Mayor Anne Thane, who serves as president of the New York State Conference of Mayors, was also on hand for the demolition. “This is a topic that is particularly one that mayors feel passionately about, and we all love a good demolition, too," saidThane. Schenectady County legislator Bob Hoffman, chair of the Capital Region Land Bank, said land banks across the state are getting to work removing or repairing the buildings that contribute to neighborhood blight. “As buildings come down it signals how much things are looking up, not just in Schenectady and Amsterdam, but in Albany, Buffalo, Syracuse, Rochester, Newburgh, down in Broome County, down in Chataqua County - anywhere there are land banks. And the land banks are starting to make a difference in our neighborhoods and our cities, and it peoples' lives," said Hoffman. While the demolition of 722 Eastern Avenue was exciting, afterward the press jumped at the chance to ask the attorney general to comment about the controversy surrounding the anti-corruption Moreland Act Commission and the Cuomo administration. The U.S. attorney’s office is now investigating after the New York Times reported Cuomo’s staff attempted to interfere with the commission’s investigations. “I think you may have heard that that is the subject of an ongoing Federal investigation and I don't comment on ongoing investigations. 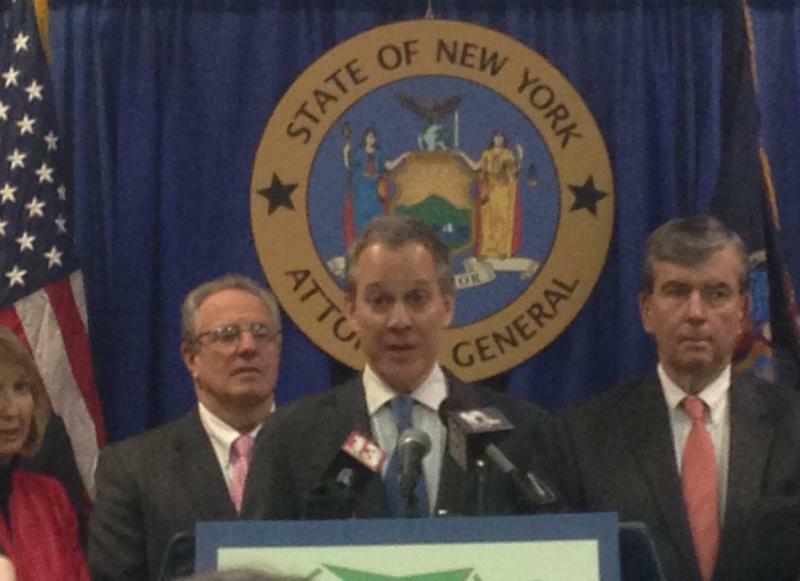 My office is cooperating with the United States attorney and we will leave it at that," said Schneiderman. New York Attorney General Eric Schneiderman was in Troy with several other Capital Region Democrats today to discuss new ways to help homeowners facing foreclosure across the state. Attorney General Schneiderman joined local and state officials and housing advocates at the Troy Rehabilitation & Improvement Program, Inc. to announce two pieces of legislation aimed at aiding homeowners facing foreclosure and helping municipalities deal with vacant properties.